I love giving designers free rein to write what they like. This is a classic case of why. You get a real dose of the personalities behind the talent -- and these two have personAlity. Funny, interesting, talented & goofy -- all big pluses in my book! Introducing Melimba & Beccabury (real names Melissa Wood and Rebecca Snyder) who have debuted with their fabric designs for Riley Blake! Anyways, it's really, really, really cute! :) Just like these sisters are really, really, really cute. See that photo of Rebecca in the red dress? Does that not strike anyone else with Jane Austenesque grace? We've got Rainy Days in yardage, bundles, and Jolly Packs®! We are sisters... two out of five children born to Roland and Denise. Melimba and Beccabury are aliases for our names, Melissa and Rebecca (we bet you can figure out who is who). We met back in 1988 when Rebecca was born. Melissa was four years old at the time, and they've been great pals ever since. Currently, Melissa is 25 and Becca happens to be 21. We grew up in Alpine, Utah and come from a long line of quilters. Our mom has been sewing, well, forever, and so did all those who came before her... so I guess you could say the fabric gene is in our blood. Right now, Rebecca is studying graphic design at Brigham Young University in Provo, Utah. She is an avid cook and is constantly wowing her family and friends with her culinary skills. She's introduced us all to things like spinach and feta cheese, two ingredients that have really made our lives more exciting. She always borrowed Melissa's clothes growing up... and happened to look MUCH cuter in them than Melissa ever did. 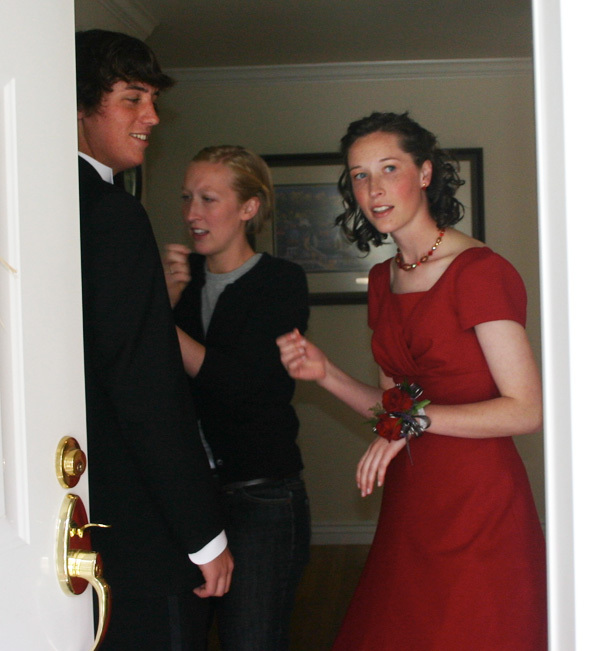 Here is Becca on her way to the Homecoming dance in high school, rocking Melissa's red dress. Melissa graduated from Brigham Young University in 2006 with a BFA degree in painting and drawing. She currently resides in San Antonio, Texas, with her husband and two children (daughter, Miss Matilda=2 and son, Mr.Calvin=2 months). Because these two kiddos are the only grandchildren and the only niece/nephew in the family, they make sure to frequent Utah every few months. During these visits, Becca and Melissa have important "board meetings" in their mom's kitchen while eating cereal and discussing new possible lines of fabric. Always pretty official. Melissa used to be a pro with Adobe Illustrator (the program they use to create patterns like used in Rainy Days and Mondays), but now since Rebecca is an actual graphic design major, she has surpassed Melissa into an expert level and now gives Melissa tips. 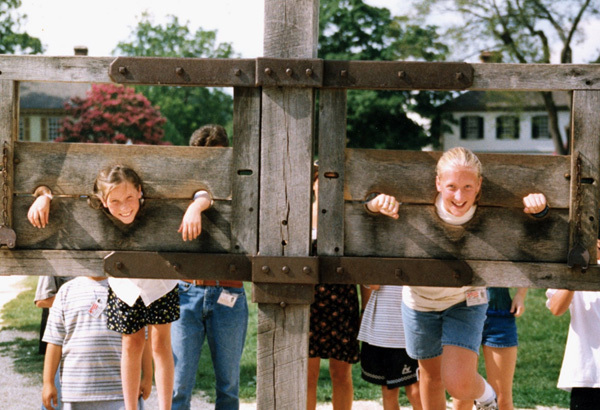 As the older sister, Melissa has been used to showing Becca the ropes. 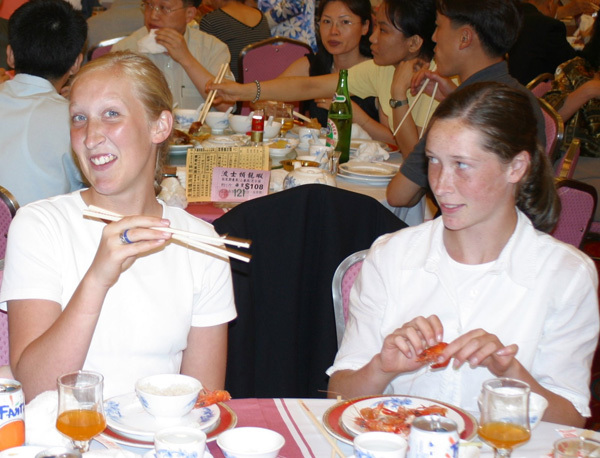 This is illustrated in a picture taken in China where Melissa is demonstrating the fine art of using chop sticks. Notice how intrigued Becca is. Well, the tables have turned. Together they can accomplish anything... from eating Chinese food properly to creating fun patterns. We would describe our style as graphic and geometric. We like simple shapes and then build them up with embellishing details. Our inspirations include old fabric from our mom's stash, old library books, really good music, and of course, the blogging world at large. We find a lovely pile of inspiration on our google reader daily. Rainy Days and Mondays came about when we were introduced to Cindy, the leader of the pack at Riley Blake Designs. We had some ideas about possible fabric lines in our sketch books and presented them with the "umbrella and rain" concept. Fortunately, they liked it! We fine tuned the details and worked through color schemes with their guidance, then sent it off to do the rest of the magic! We titled the line "Rainy Days and Mondays" because our mom is such a big Carpenter's fan (and now we are too). If you are familiar with the lyrics, you'll remember, "Rainy Days and Mondays always gets me down..." HA! With this fabric line, we're hoping to help people have fun in the drizzly gray weather. We are thrilled with how vibrant the colors turned out and think it's pretty fun to see our designs on such a large scale! What's next for us? We're working on a concept that might work for autumn time. We are fans of fall colors and think it would be fun to create a line to go with our favorite season. Typically we have 4 or 5 ideas that we're working on at any one time. So, you'll be surprised, like us! favorite talent: becca & melissa =memorizing Broadway show tunes and singing them at the top of our lungs... while dancing in front of the windows (at night, they make fabulous mirrors and, well, entertainment for the neighbors).